So, you've made the decision to purchase a multimodality machine (MMM) to expand your practice. That's the easy part. Now, how do you go about choosing the right unit for your practice? In our practice, we looked at many models and we developed a three-part process to make a thorough evaluation. I like to break it down into three areas: the imaging machine, machine programs, and software and support. Space Foot Print - If you have an existing office or are building a new office, it has to fit in different ways. Machines have three requirements: a physical space, minimal operational space and an accessibility space. If you have an existing office, stand-up machines will have a smaller physical space requirement. The minimum operational space is the least amount of space for the machine to operate while taking an image. The machine might fit, but the head has to rotate. Accessibility space is often overlooked. Not having good accessibility limits your patient population. Sit-down machines have a disadvantage of transferring the patient from a wheelchair or other mobility device, requiring more space. A stand-up machine should have the flexibility to be lowered to the height of a wheelchair. Many elderly patients have dropping head syndrome and are more comfortable in their own wheel chair or a small chair. Flat Screen Technology - This is your X-ray sensor or film onto which the image is projected. Image sensors fall into two categories: image intensifiers and flat panel detectors (FPD). Flat panel detectors are the next generation in digital technology. They are sensitive and fast, and last longer without any replacement or calibration. Image intensifiers (like CAT scans) need to be serviced and imaging might diminish over time. Some machine companies offer service contracts on image intensifiers for future issues. The available machine programs are the bread and butter of treating a diverse patient population and expanding your practice. When deciding on a 3D image, think about your field of view (FOV), or how much you want to see and accomplish in your practice. Next, think about your regions of interest and areas you would like to diagnose. Pain Diagnosing - A patient comes in with diffuse pain on the left side of the face. If your machine is limited to only a small volume size (3x4), 8-12mS, you would need to take multiple volumes to capture the whole side. If you took three additional small volumes to get the unilateral side, you are now at an average of 32-48mS. For our endodontics practice, we prefer a medium FOV 8x8 or 4x8, but having the flexibility to go smaller. For pre-screenings for diagnosing pain or medical clearance (oncology, orthopedic, cardiac), a small volume only 3x4 FOV was not practical. Too many scans, and separate volumes to open, copy, study or transmit. Implantology - For the growing practice, a bilateral FOV is more advantageous for treatment planning and more cost effective for the patient. Having a single bilateral scan reduces the amount of scans, radiation, and time to the office and patient. Surgical guides crossing the midline are needed to place bilateral implants. A small-volume-only machine means more surgical guides, increased office time and increased cost to the patient. Panorex - Look for a MMM that has the ability to take both two-dimensional (2D) panorex and three-dimensional (3D) imaging. Pay close attention to what you are actually purchasing. If you are purchasing panorex in a MMM, make sure it is a real panorex. Make sure you can utilize and bill for it. A panorex, CDT code D0330, is based upon the image, and the science behind it. Based on the principle of the reciprocal movement of the X-ray source and an image receptor around a central plane, in which the object is located giving us a 180-degree from ear to ear consisting of both maxillary and mandibular arches. A 3D cone beam machine can reconstruct a 2D image using existing data from a 3D scan (Fig. 1). This image is CDT code D0362, a slice layer taken from the 3D volume (Fig. 2). Many insurance companies do not pay for the latter if you submit that image as a panorex image, hence, insurance fraud. Panorex programs and images can be very sophisticated for diagnosis with the right technology behind them. A segmented panorex program provides variable regions of interest and a lower radiation dose. The Planmeca panorex has a Smart Pan feature. It can calculate nine serial image layers with a 2mm shift. So, do your homework, and see what beneficial features a MMM may offer and determine how it will benefit your practice. Extraoral Super Bitewing - When looking for a MMM, this is a must! Actually, it is a must for any practice. In less than eight seconds, the image is obtained in one extraoral exposure with a low radiation dose. No overlap and geometric distortion. Look for a MMM with this feature. This makes treatment and diagnosing of children, gaggers and compromised patients simplistic. Your staff and patients will thank you (Fig. 3). TMJ Programs - Studies have shown that clinical assessment of TMJ disorders is often inconsistent with joint imaging studies. A wide variety of issues - osteoarthritis, remodeling, internal derangement and fracture - can have different modalities of treatment. Look for uni and bilateral TMJ programs in a MMM in both 2D and 3D imaging. In a 3D program make sure the FOV is sufficient enough to encompass the entire joint. All are important software features that make your treatment planning more proficient. Airway Program - Symptoms of obstructive sleep apnea, mouth breathing and chronic sinusitis are disease processes that can perpetuate problems in the oral cavity. Having a proper appliance and working in unison with the proper physician provides the patient with more comprehensive treatment. Patients prefer an image to be done right in the office. It is less costly, more convenient, has significantly less radiation dose compared to a traditional hospital, and patients tend not to get lost in the referral process. Stitching Programs - A stitching program allows you to take two or three consecutive volumes and sew (stitch) them together to give you a larger volume. A stitching program should be a standard program with every machine. A good stitching program should have the versatility to do horizontal and vertical volumes. Depending on the software, the total image may be smaller and at a lower resolution. Always ask to see a few stitched volumes when comparing images from different machines. If you think you will be doing this often, you need a machine with a larger volume that has the flexibility to take smaller volume without losing resolution (Fig. 6). Software is the heart of your detail and imaging. Look for the companies that have good Research and Development. Ask how many upgrades have accrued in the last two years. Look to see the difference between the older and newer programs. Artifact Removal Program (ARP) - This is one area many companies do not talk about that I feel is very important. 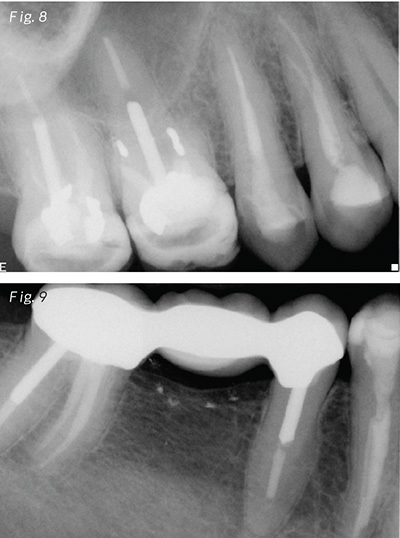 Artifacts are the white streaks produced in the image by dental metals. These include amalgam, gold, restorations, PFM crowns, implants, gutta percha, metal posts, bone screws and orthodontic brackets. An algorithmic math equation is used to smooth out the artifacts, to make the image look clearer. Algorithms are not selective! Many machines run the ARP automatically and give no option of a raw volume without it. If you don't see many fracture lines, there is a good chance the lines were removed by the pre-programmed ARP. Fig. 7 shows a fracture line before and after the ARP was implemented. Look for a machine that gives you a raw volume and the option to run the ARP. Ask your sales representative for scans with a variety of restorations. 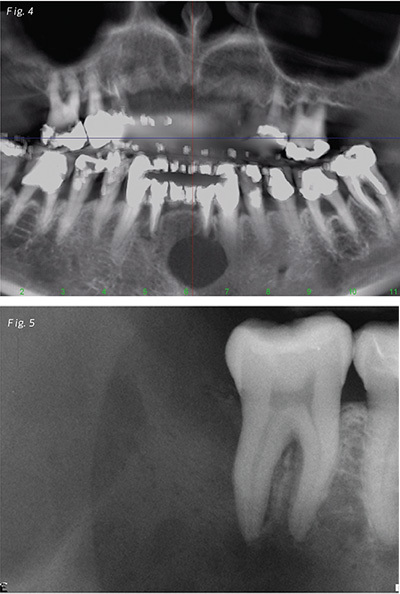 Also, ask for cases with small fractures that you can compare 2D and 3D on the same tooth. Ask for at least five patient scans to see how the machine handles the issue. Radiation Dose - This is like doing your taxes; it's confusing, with multiple answers. When told that a machine has the claim to lowest radiation dose, prove it! It is very difficult for one machine to have the claim of the lowest dose. There are too many variables that go into taking an image. All machines are very different! So what did we do? Our practice chose a MMM that gave us future versatility! The unit we chose gave us the option of 16kVs and 16mAs. Many machines lock you into a standard mA and a few kV adjustments. In time, as the flat panel sensors and software improve, you will have the option to use less radiation without an expensive upgrade or changing your machine! 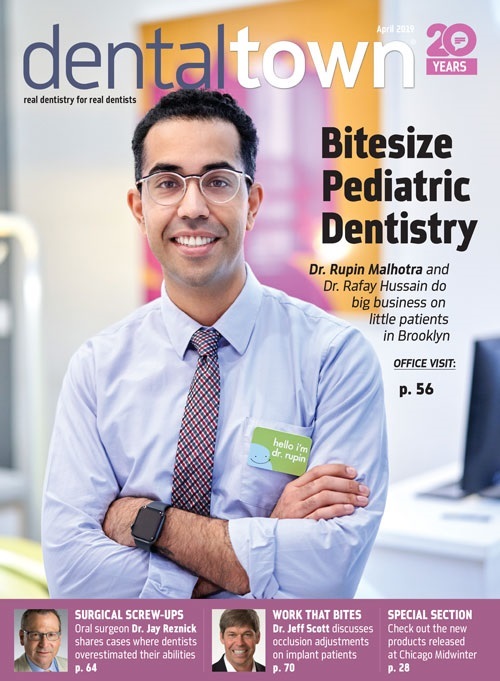 Patients may look to this direction as 3D imaging evolves in dental practices. Look for companies that plan for the future, it becomes a cost savings for your office. The voxel is a 3D pixel in which the resolution of a 3D image is determined. In theory, the smaller the voxel size the better the resolution. But, smaller voxel size gives you more noise and higher dose of radiation. It is similar to looking though your surgical microscope at the highest magnification, it is grainier and difficult for your eyes to interpret the image. Look to a solid company having good Research and Development for future improvement to the software and its interpretation of the data. Image Variation - Volume size is one aspect we have talked about. Having the flexibility to do various size volumes has a large advantage. What about patient size? A child, teenager and linebacker will not all have the same jaw shape. Jaw size can vary in shape. Shapes can vary from triangular to U-shape. Having a variety of jaw shapes and volume size allows for more image flexibility for rendering a volume (Fig. 8). Operating Software System - The brains behind your image tell the machine how to render the image, how to process the image, and how to deliver the image. Upgradeability - There are two aspects to this that are very important: the machine and the software. Maybe you can't afford all the bells and whistles yet. A reliable company will be able to upgrade you from the panorex to whatever degree of 3D that you feel comfortable with on the same machine. Yes, without putting a new machine in and at a nominal cost. Don't be afraid to ask for comparative pricing. Make sure the company has a history. Second, just like when your cell phone automatically upgrades its software, so your operating system should be upgraded. Get a good history. Ask questions. How many upgrades have been done in the last few years, and is there a cost? Ask to physically see the difference in the programs. What about future integration and third-party programs? The way technology is moving you will be able to plan your patient's whole treatment plan right from your computer. Is third-party programming already integrated or can they be easily integrated into your programming, Dolphin, Materialise, etc.? It makes your life simpler (Fig. 9). DiCom imaging should be a staple. It is universal and the quickest way to send via the Internet. Your machine should be able to send and easily import. If you use a Mac or PC, make sure that your operating system can do both. Technology changes and is hard to predict what the future holds; better to have the flexibility at your fingertips. How easy is it to manipulate and study your images? Can you stay in the same operating window or do you have to go to another window to view a different angle? What about the warranty? How long is the warranty? Are there any service contracts? Who is responsible for fixing the computer or the unit? Does the repair technician live local or three states over? Phone support is crucial! Support should come from the unit company and the dental supply company. Look for established companies. Companies that are sold and resold may lack in Research and Development. Do your homework. Decide what you need and expect from your machine. Ask for references of the last 10 sales. Ask for five patient volumes to manipulate at home on your computer. 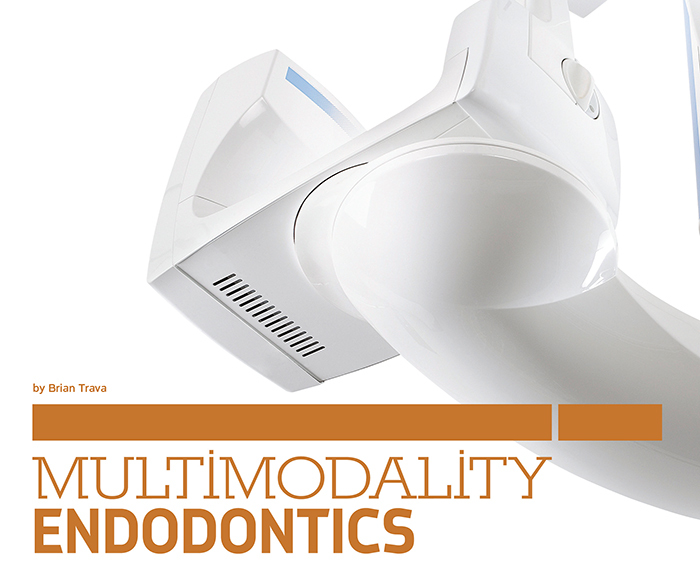 Choosing the right multimodality machine and company is a one-time investment to enhance your practice. Now, you may ask, which unit did we choose? The Planmeca ProMax 3D, for all the reasons discussed. Dr. Brian Trava graduated from the University of Medicine and Dentistry of New Jersey. He specialized in endodontics. He practices in four locations in New Jersey.